Despite Barcelona boasting a modern, effective and relatively cheap Metro and bus system, the city is the perfect size to explore all of its major attractions by foot. Even if you’ve only a limited time to spend in the City of Counts, you’ll still be able to enjoy its charm, history and stunning architecture in under one day. Below we’ve compiled a list of some of the reasons millions of people flock to Barcelona each year, and why you’ll love making just a flying visit on your Mediterranean cruise. Unquestionably, one of the largest pulls to this grand city is its modernist architecture, and specifically the work of Catalan architect Antoni Gaudi. The most famous of his works, the Sagrada Familia, began construction in 1882 and is to this day yet to be completed. His other impressive works scattered around the city include La Pedrera, Palau Güell, Casa Batlló and Casa Vicens. Gaudi however wasn’t the only prominent modernist architect to make a long lasting and positive affect on the city’s architectural design. Puig I Cadafalch is responsible for the stunning Casa Amatller and the Palau de la Musica, whilst Domenech I Muntana designed the iconic Casa Lleo Morera. 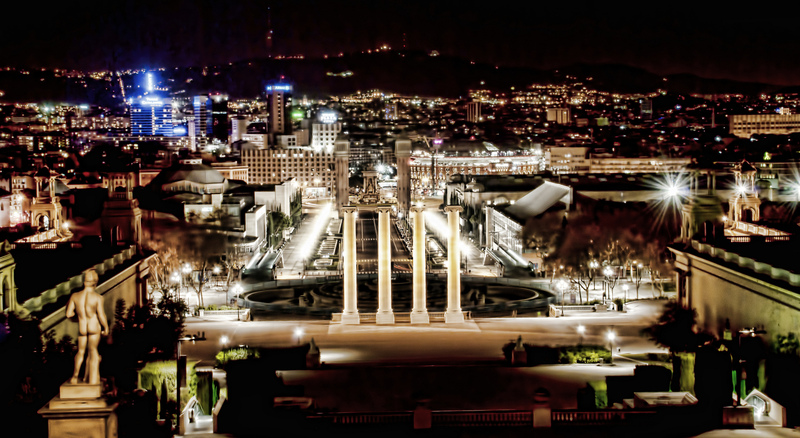 For one of the world’s major economic, tourist and trade cities, Barcelona is home to an impressive 68 municipal parks. The largest of which is Montjuic, which offers superb city and harbour views given its lofty position in the South West of the city centre. The impressive Palau Nacional (National Palace) can be found here as well as many of the venues from the 1992 Summer Olympic games. Parc de la Ciutadella is the second largest of its kind in the city, boasting 70km of lush greenland, a boating lake, some museums, a fountain and even a zoo. A trip to Barcelona simply wouldn’t be complete without a casual stroll down the city’s main thoroughfare, Las Ramblas. Cutting through the heart of the city centre, this lively and bustling promenade is lined with trees, tapas bars, street performers, chic cafes and unique architecture. Perfect for a morning coffee and pasty, the Placa de Sant Josep Oriol, situated in the heart of Barcelona’s Gothic Quarter, is a quaint and charming square surrounded by winding lanes and shopping streets. Far form being just an open-air museum, Barcelona Gothic Quarter and Old Town may be home to a lot of ancient buildings but still very much emanates a ‘lived-in’ and lively atmosphere with a whole host of shops, cafes, bars and restaurants housed in far less modern structures. Got more than one day? If you’re lucky enough to have more than 24 hours in this wonderful Spanish city, why not spend a day relaxing on some of Barcelona’s 4 kilometers of sandy beaches? A refreshing dip in the light blue Mediterranean sea is a perfect way to end a long day of exploration around this historic, vibrant and simply beautiful city. Take a look at our full range of Mediterranean cruises. Alternatively, you can give our friendly sales team a call on 0808 274 6777.